James attended school in Nanaimo and Dundas, Ontario. In the 1870′s he continued studies in Virginia, where he was aiming at nothing higher than the position of mine manager. It is in Virginia he met Laura Surles, whom he married in 1876 and eventually brought back to Vancouver Island. Laura Surles was the daughter of a North Carolina farmer, one of the most largest, prominent land owners in the region. She welcomed her husband’s growing importance, if only because it allowed her to climb British Columbia’s social ladder. James and Laura had twelve children, of which there were three boys and nine girls. When first married, they lived with Robert and Joan in Fairview. Later, James and Laura moved to their own home called Burleith. In 1898, James Dunsmuir won election to the provincial legislative. Two years later, during a period of political turmoil, he agreed to serve as Premier of the province. In 1902 he resigned the premiership, stung by charges of conflict of interest in formulating his government’s railway policies. 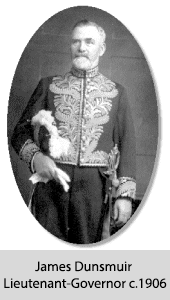 Appointed Lieutenant-Governor in 1906, he was an uneasy occupant of the Vice-Regal office. The criticism he received when he refused to give Royal Assent to anti-Oriental legislation turned to howls of outrage when it was discovered he was recruiting cheap Japanese labour to work in his mines. In 1908, while James was Lieutenant-Governor (1906 – 1909) he began construction on Hatley Park on the Esquimalt Lagoon. Despite his wife’s social ambitions, James Dunsmuir remained devoted to simple pleasures. He was happiest in the company of a few male friends, fishing and bird hunting. After his first boat, the Thistle burned to her waterline, he ordered a fine new yacht. 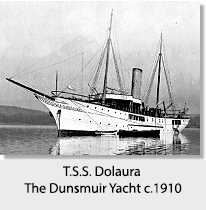 Built in Scotland, the Dolaura was 218 feet long and cost more than $200,000. The Dolaura provided the comforts of home, including a mahogany-panelled drawing room warmed by a huge fireplace, and a dining room capable of seating twenty-four guests. The Dunsmuirs’ private suite included a large sitting room, a bedroom, a clothesroom, and a white-tiled bathroom equipped with Venetian marble washbasins and sterling silver fittings. James Dunsmuir resigned from office in 1909, determined to put public life behind him.